These areas are defined more by proximity to sights than actual neighborhood boundaries. The famous cathedral Santa Maria del Fiore, more commonly known as the Duomo, is the heart of Florence. You can see its dome by Brunelleschi and the belfry from most places in the city. This is tourism-central so streets are busy with visitors, but also convenient to important sights, shops and restaurants. The Duomo and the Baptistry are musts. Piazza Signoria the picturesque center of the Florentine republic that enabled the flourishing of the Renaissance. Italy Perfect offers an excellent selection of in this area, from budget to luxury: Prisco, Strozzi, Michaela, Diana, Artemesia, Beatrice, Caterina, Giovanna and Sandra. From the main train station to the river is a fine area to stay in Florence. Very central with great shopping, dining and easy access to the sights. Santa Maria Novella church with its art and its piazza. Officina Profumo Farmacutica di Santa Maria Novella – famous and fragrant. Via Tornabuoni, the center for designer shopping and a traffic-free street for a stroll is bracketed by the only baroque church in Florence San Gaetano and the beautiful church Santa Trinita. Piazza della Repubblica, grand piazza, good location for people watching from a café table. Mercato Nuovo. Famous covered market with the lucky bronze boar in front. Nice for souvenir shopping. Italy Perfect offers these apartments in this area: Falco, Nido, Rondine, Merlo, Pavone. Pantana, Parione Perfetto. Wonderful area filled with sights and shopping. Busy with shoppers and tourists. Medici Chapels and San Lorenzo church. 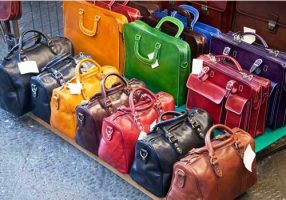 Next to the church is the largest outdoor shopping area in Florence, great for souvenirs and bargains. Ospedale degli Innocenti famous orphanage with Della Robbia medallions and the “foundling wheel” for anonymous baby drop off. The basilica of Santa Croce is an impressive landmark in this area that is interesting and filled with interest. Good dining and nightlife. 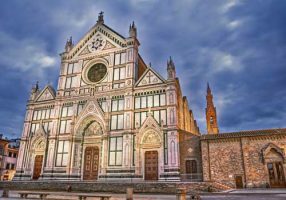 The basilica of Santa Croce is on your short list for Florence. The frescoes, art and sculptures of the interior honor the gods of Italian art and science who are buried here including Galileo, Michelangelo and Marconi among others. There is a museum and artisan workshops in the complex. 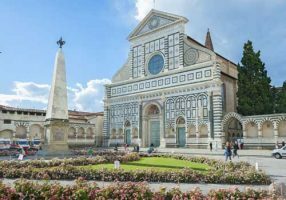 Piazza Santa Croce is the largest piazza in the center of Florence so a nice place to sit and enjoy city life and dine. It hosts events from time to time, including the incredible games of the Calcio Storico in June. Sant’Ambrogio Market is just to the east of Santa Croce, a large, covered farmer’s market. Worth a visit. Just north is the beautiful Synagogue and Piazza dei Ciompi with periodic flea markets. Italy Perfect offers these apartments in this area: Alcove, Belvedere, Benozzo, Casa Toscana, Donatello, Giotto, Medici, Mimi, Miravista, Paradiso, Tosca and Tesoro. 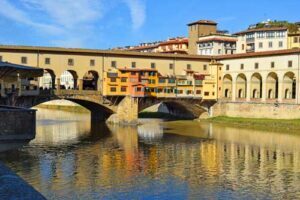 Just across the river, is the Oltrarno (other side of the Arno river) that is known for its artisan workshops, antique furniture and art galleries. Don’t think that because it is across the river it isn’t in the center. It is. 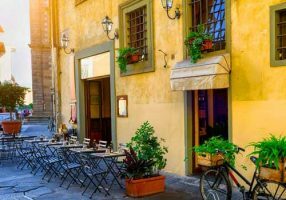 It just has its own character and if you get away from the main streets, you experience Florentine neighborhood life as it has been for a millennium. Ponte Vecchio, the iconic old bridge with shops. Piazza Santo Spirito has a morning weekday market in the center for fresh food shopping. Good restaurant choices and good night life, too. The Pitti Palace and Boboli Gardens offer the Medici family’s palace filled with art and history paired with extensive beautiful gardens. The Bardini museum and gardens are a calm and rich experience. This neighborhood is also the starting point for visiting Piazzale Michelangelo with its panoramic views of the city that you see in many photos. Italy Perfect offers these apartments in this area: Casetta Bonsi, Torella, Vela, Corvetta, Caravella. A Tuscan village inside Florence, also on the Oltrarno side of the river. Although central and convenient it is less touristy, artisan workshops at street level have been here for centuries. It houses a number of excellent restaurants. Porta San Frediano, that opens onto the road to Pisa, has a mighty fortification and pieces of the old city wall. Italy Perfect offers these apartments in this area: Olivia. Pleasant, local neighborhood just a short walk from the center and away from the crowds. Quiet streets with consulates and the beautiful Polimoda school villa. Good restaurants. Porta al Prato, nice area for shops and the ancient city gate. 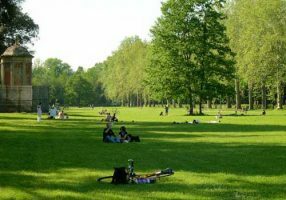 Cascine Park, excellent park for a walk, see the velodrome, shop in the outdoor market and see events in the amphitheatre. Ognissanti Church with frescoes by famous painters including including one of the Vespucci family with young Amerigo. Italy Perfect offers these apartments in this area: Vespucci, Amerigo’s Vista. 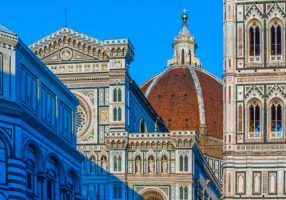 Apologies if we have been brief and have merged areas that you may think of as different, but, in the end, the center of Florence is small and easy to visit from any of the Italy Perfect vacation rentals.